APD Managing Director Mike Isherwood speaking at the Control Room Awards 2018. Last year’s winners included London Fire Brigade’s Two Watch control room team for their calm and collected response to the Grenfell Tower inferno, which helped many people to escape the burning building and David (Edd) Redwood, of Cornwall Fire and Rescue Service, who demonstrated exceptional performance and collaboration with several services in the multi-agency management of a flash flooding situation and helped save the life of an elderly woman trapped in rapidly-rising floodwater. Entries for the 2019 awards are now open and the awards ceremony takes place on 7 March 2019, at the De Vere Orchard Hotel in Nottingham, when finalists and guests will enjoy an evening of celebration, reward and recognition. The cost of shortlisted nominees’ tickets will be covered, making it possible for all finalists to attend. APD Managing Director Mike Isherwood said, “Because of our work providing technology that supports and connects emergency services organisations and their control rooms we’re very well aware of the amazing work of staff in these operations and the vital service they provide to members of the public. Once again leading technology provider telent Technology Services will be the Platinum Partner of the awards. telent specialises in the effective operation of critical national infrastructure and is at the heart of many of the UK and Ireland’s best-known brands. The company has long-standing relationships providing frontline operational technology solutions to emergency services and public safety organisations across the UK and Ireland. 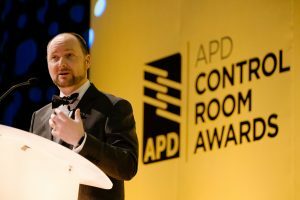 For more information on the APD Control Room Awards 2019 go to www.controlroomawards.com and follow the awards on Facebook: @controlroomawards, Twitter: @CR_Awards and LinkedIn: Control Room Awards.